Salvation in Christ is a most precious gift. Indeed, it is the greatest gift of all. Dear God, give us the grace to meditate on the magnitude of the gift of salvation merited by Jesus Christ. Yet, here in the United States and Canada (and certainly in Europe, too) we are witnessing an unprecedented loss of faith. People who can look back at generations of Catholic ancestors who preserved the faith for them have now themselves become the very reemergence of that family’s pagan line of descendants. This loss of faith has enormous implications, and has even the momentum of a mass apostasy. It is worth contemplating what happens to a Christian nation, once blessed by the Gospel, which then rejects it? Perhaps more often than a human being breathes in air for physical life God is sending each one of us actual graces to grow closer to Him. On God’s part He is doing everything possible to save us. Here is the great risk God allows: we can reject his many graces and perish. Jesus warns us of this risk on many occasions. The great Saint Pope John Paul II, a man of very great wisdom, had some very important words to say about the radical possibility of a human being – endowed with a free will – rejecting God’s invitation to eternal life. In Dominum et Vivificantem Saint Pope John Paul II explains in sobering terms that the “radical refusal [of a person] to accept [the] forgiveness of sin” means that this person claims the right to “persist in evil” (46), despite the fact that the Holy Spirit has been sent to convince the world about sin and judgment. “Those who are converted,” says Saint John Paul II, “are led by the Holy Spirit out of the range of the judgment, and introduced into the righteousness of Christ….” (48). To reject the the convincing concerning sin which comes from the Holy Spirit, a human being is, in essence, rejecting the “redemptive power of Christ’s blood” (46). “Man” perishes” when he loses “eternal life”. The opposite of salvation is not, therefore, only temporal suffering, any kind of suffering, but the definitive suffering: the loss of eternal life, being rejected by God, damnation. The only-begotten Son was given to humanity primarily to protect man against this definitive evil and against definitive suffering. In his salvific mission, the Son must therefore strike evil right at its transcendental roots from which it develops in human history. These transcendental roots of evil are grounded in sin and death: for they are at the basis of the loss of eternal life. The mission of the only-begotten Son consists in conquering sin and death. He conquers sin by his obedience unto death, and he overcomes death by his Resurrection” (no. 14, Encyclical Salvifici Doloris). Is it possible to grow in holiness if we are not concerned for souls? Zeal for the salvation of souls is a hallmark characteristic of the Saints. The need for a new Evangelization could not be greater or more urgent. 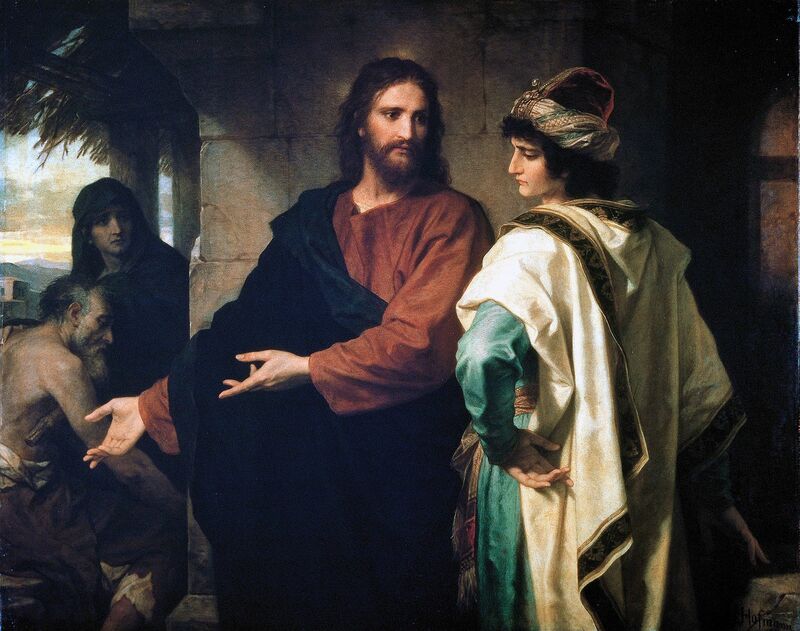 Image: Christ and the Young Rich Man by Heinrich Hoffman, 1889, Public Domain, U.S.A.
P.S. How much grace God sends to someone estranged from Him is not subject to precise theological formulation.The starting point is the Infinite Goodness of God who is generous to every soul. The great Saint Alphonsus de Ligouri quotes with approval Soto who said: “I am absolutely certain, and I believe that all the Holy Doctors who were worthy of the name were always most positive, that no one was ever deserted by God is this mortal life.” A more recent theologian, Father Garrigou-LaGrange says, “Christ’s humanity communicates to us from minute to minute the actual grace of the present moment, as the air we breathe continually enters our lungs. *** Outside the sacraments, this activity of the Savior transmits the lights of faith to unbelievers who do not resist it.” Finally, Father Faber states: “Figures could not put down the number of graces He has given and is hourly giving to us” (p. 142); Faber states that even a man in mortal sin, through faith and hope, receives “incessant crowds of…actual graces” (p. 250). At page 313 Faber states that “God is infinitely merciful to every soul,” and “no one ever has been lost…by surprise….” ( The Creator and the Creature, TAN).